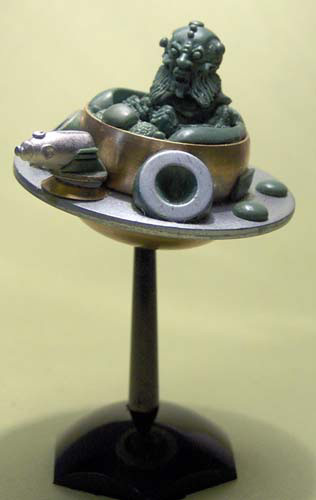 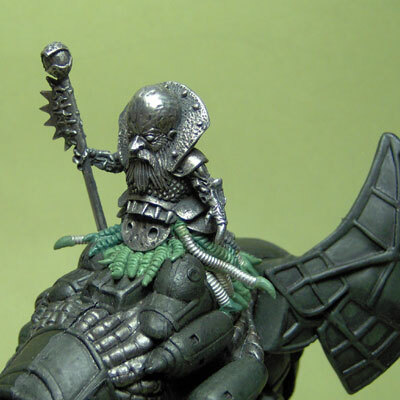 Please feel free to email me with any comments or suggestions on any of the items you see on the work bench. 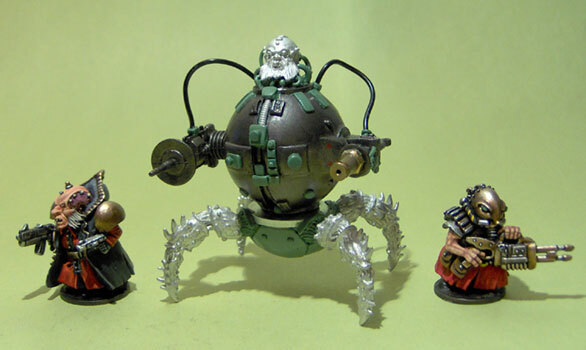 Email Bob. 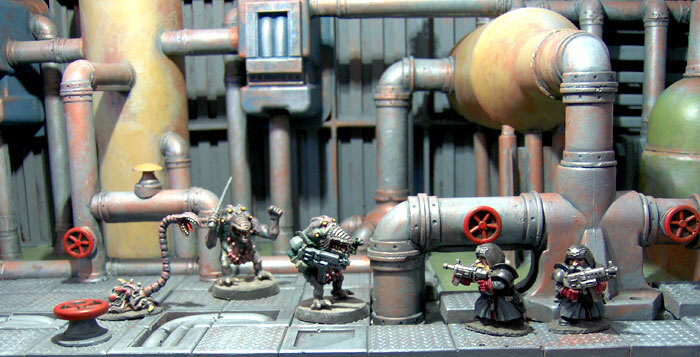 Also here's a link to Even Older Workbench News for all those bits and pieces I've either finished or have stashed never to see the light of day again. 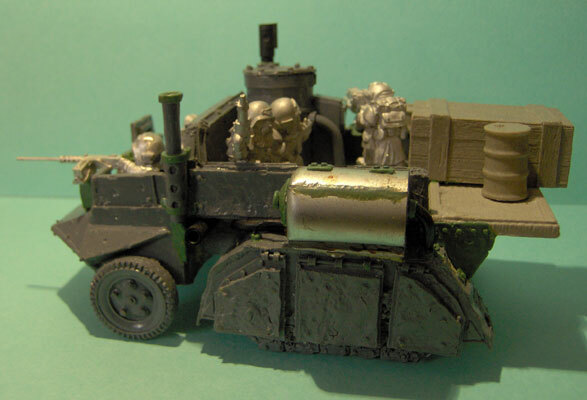 WIP Conversion of Ramshackle's Toad Vehicle to scrunt transporter I've still got work to do on this piece, but I thought you might like to see the wip. 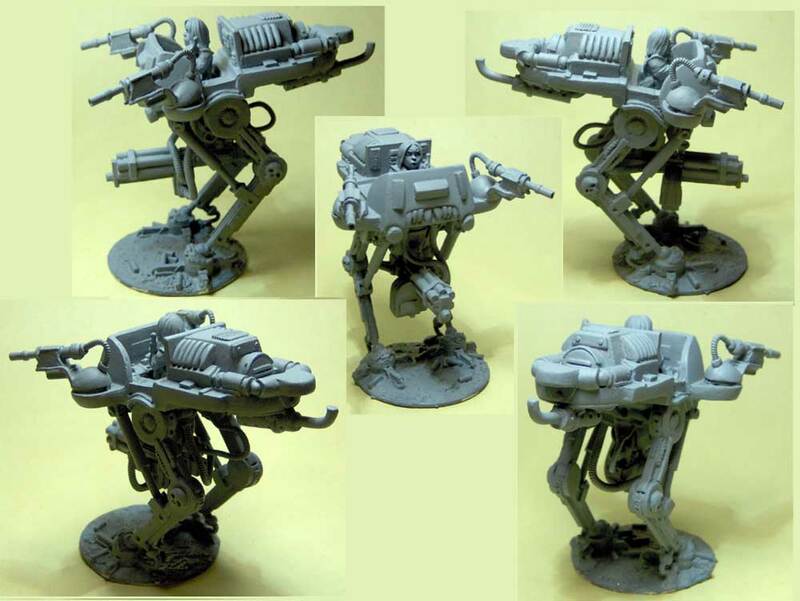 I can recomend checking out Ramshackles website, there's some interesting vehicles on it at very reasonable prices. 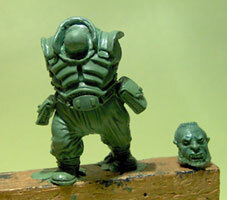 New Mutant/Alien Prototype Green and Medium Heavy New Type Scrunt Green These are WIP on two new types of figure. 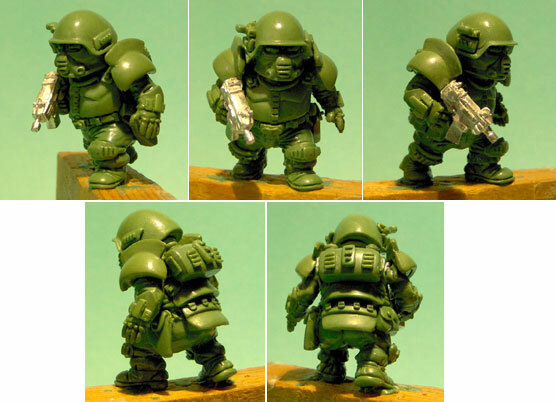 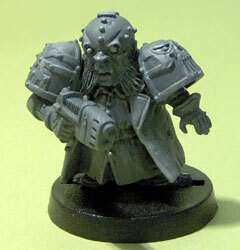 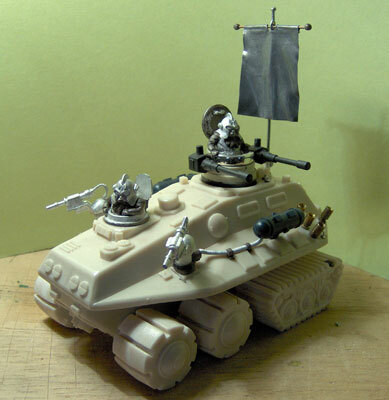 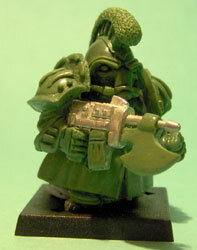 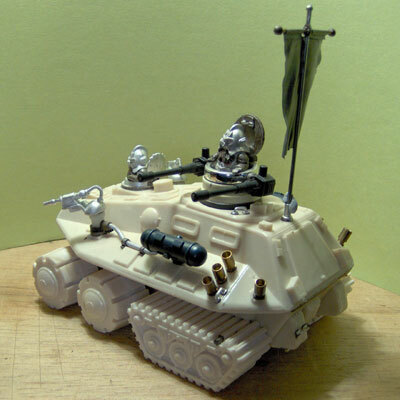 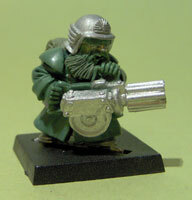 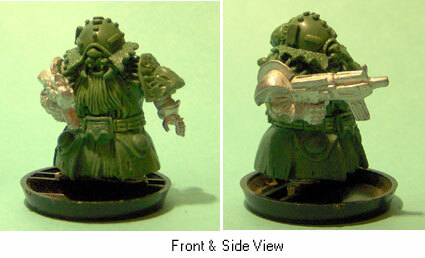 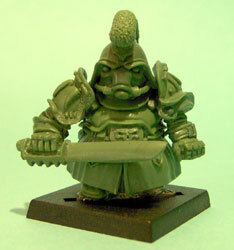 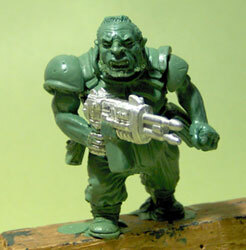 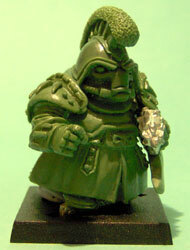 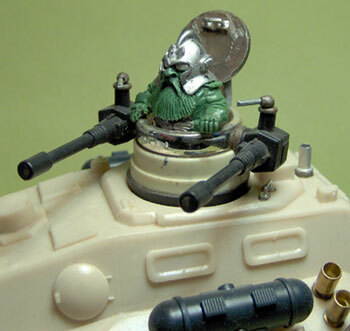 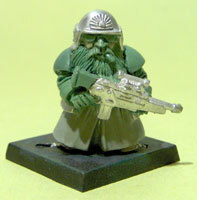 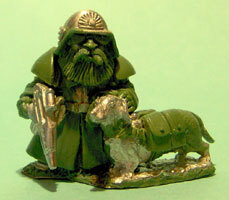 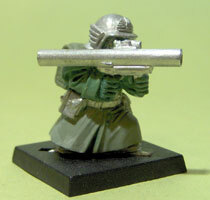 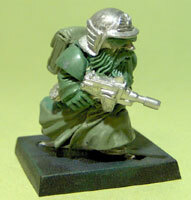 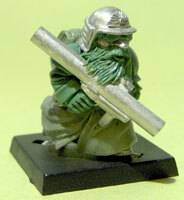 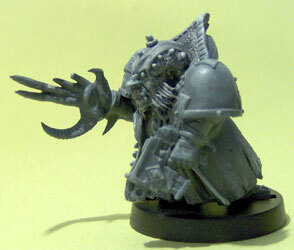 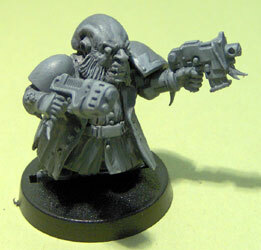 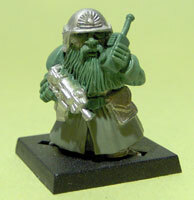 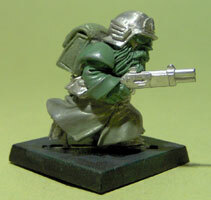 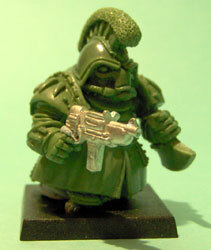 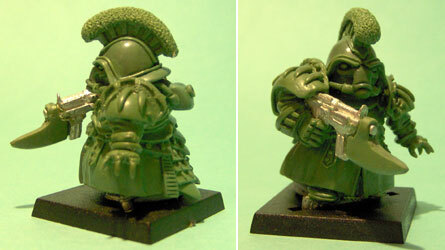 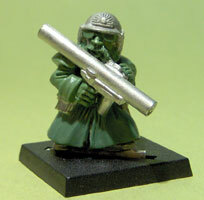 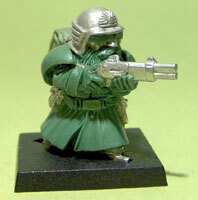 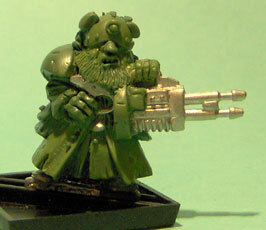 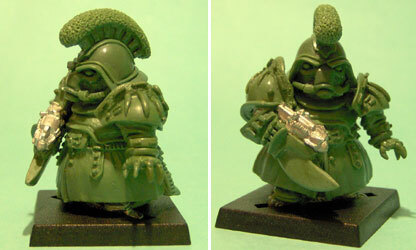 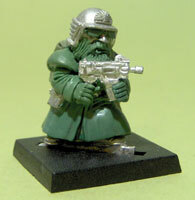 The first one is a scrunt trooper in heavy armour, he comes with seperate arms and gun. 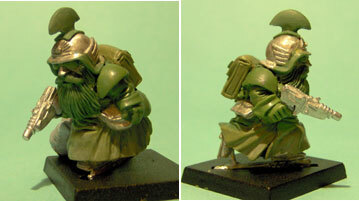 I shall go on to develop a number of seperate weapon arms for this piece. 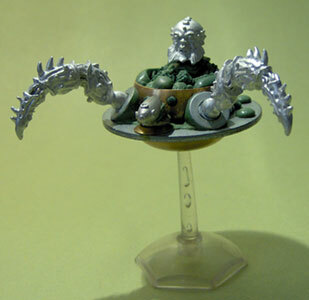 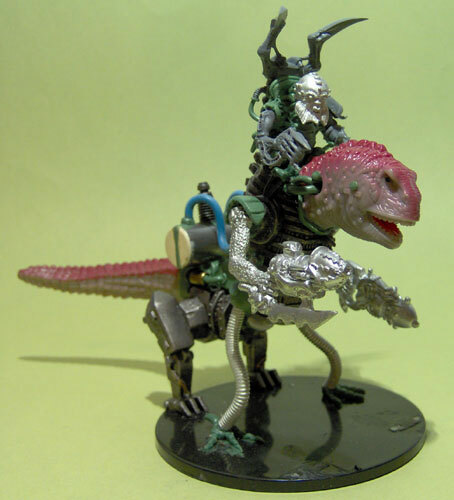 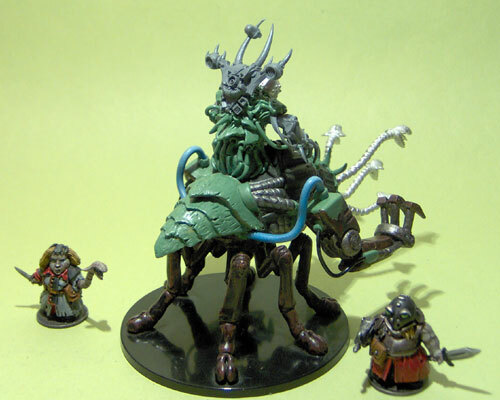 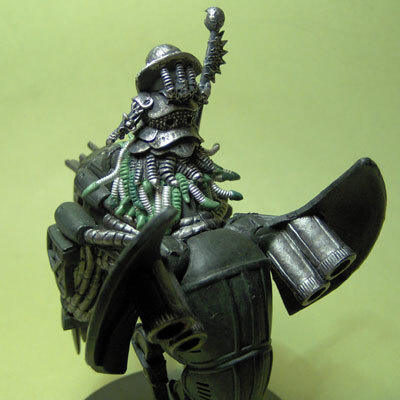 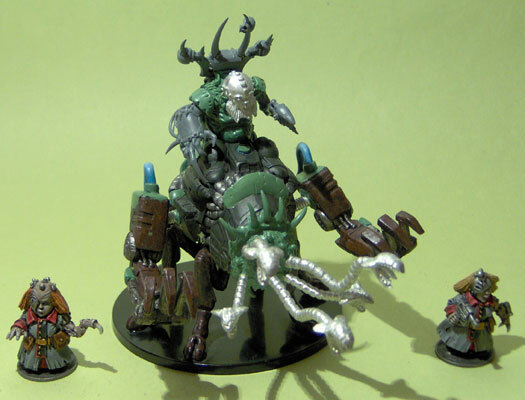 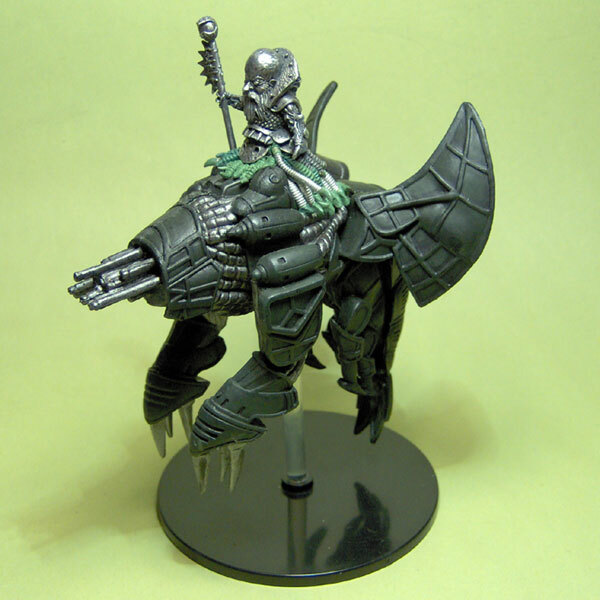 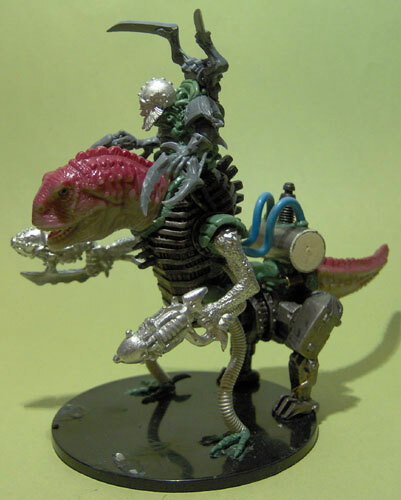 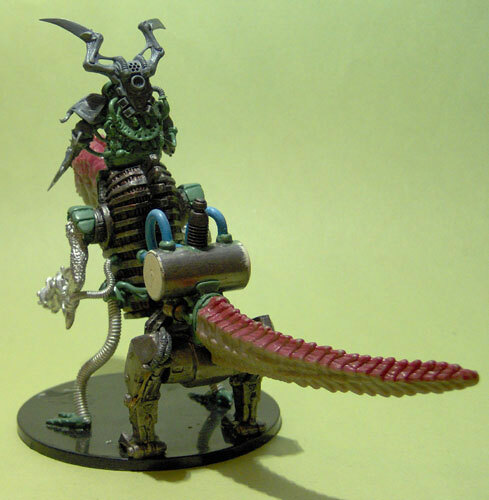 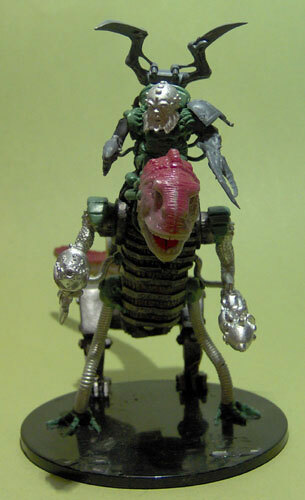 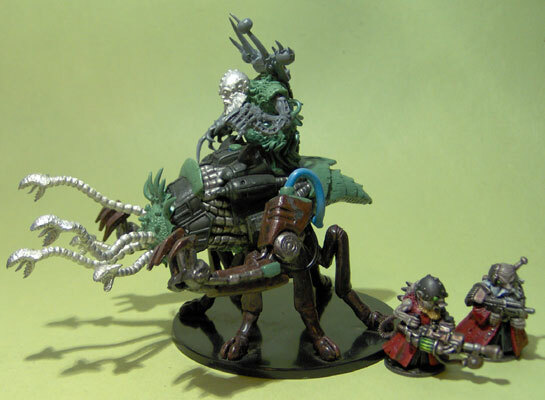 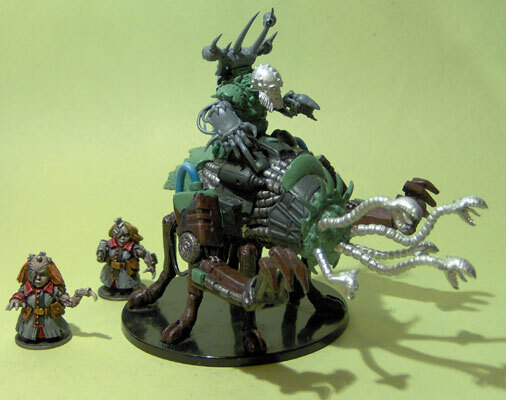 The second model is a mutant alien, this one is shown at the moment with GW plastic arms, I've yet to make my own but they will be of a similar type. 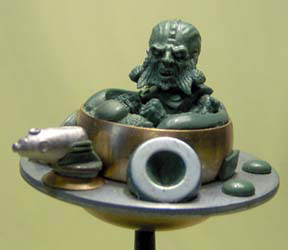 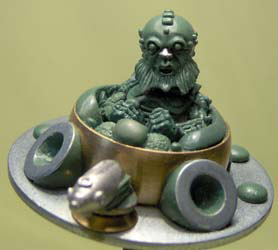 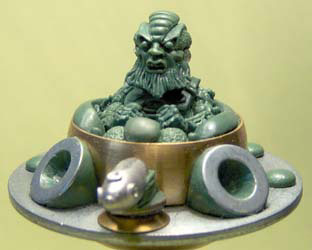 The head comes as seperate and can be swiveled to face in different directions. 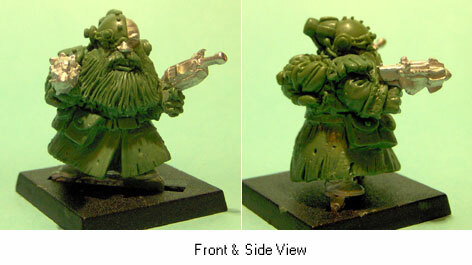 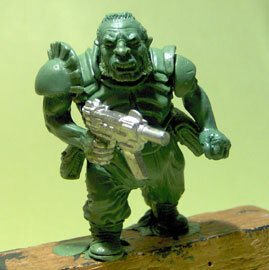 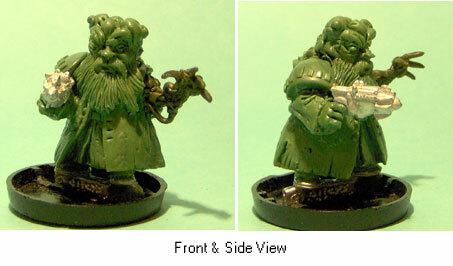 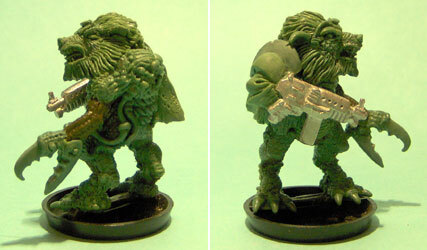 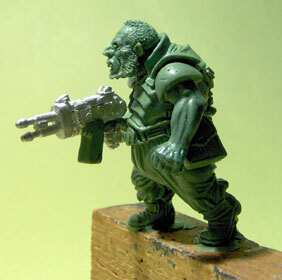 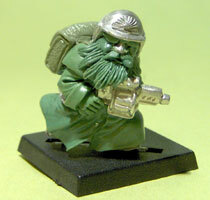 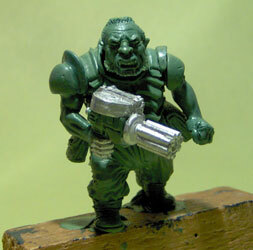 More New Greens Scrunt Mutant Hunters Many of these miniatures have separate weapons, so you can choose to change the weapon if you want to. 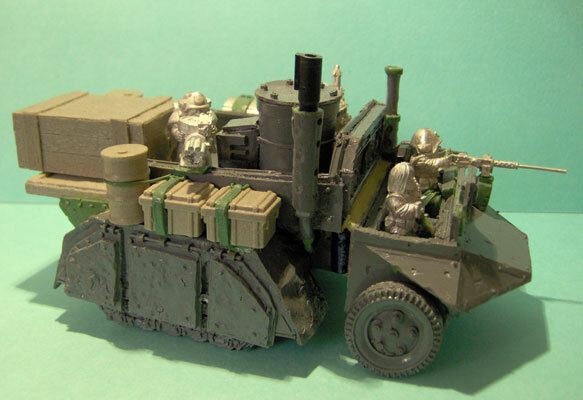 I had this idea of a cart pulled by dogs being used on the frontline to transport weapons, goods, and the injured. 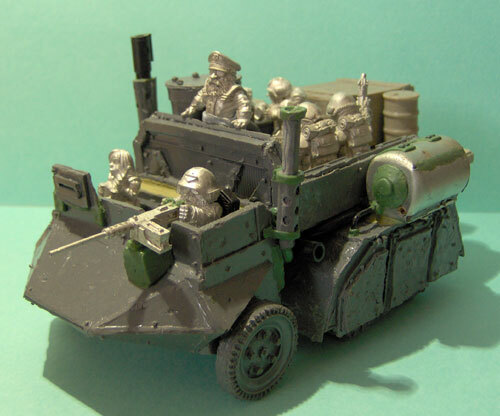 As it turned out after I had made it I saw a photo on the internet of a WW1 Dogcart, until then I hadn't realised dogs had been used this way in WW1. 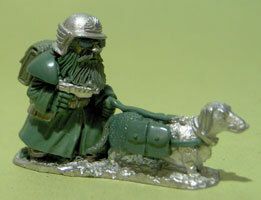 Anyway, this cart is pulled by 3 dachshunds, the dogs have packs on them carry extra bullets etc to the frontline troops. 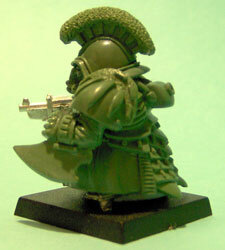 There's going to be a choice of contents, including a standing and seated scrunt, selection of weapons ect. 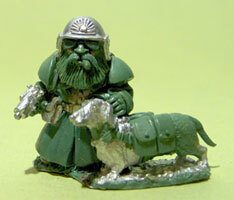 The cart with 3 dogs will be sold without contents so you can put your own things in it or choose from our selection. 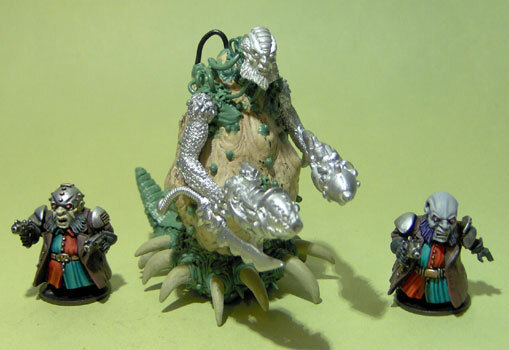 I've been working on these scratchbuilt mutant monsters as I wanted to use them with my Psychic Mutant Troops in some scenery I have planned for a new photo gallery. 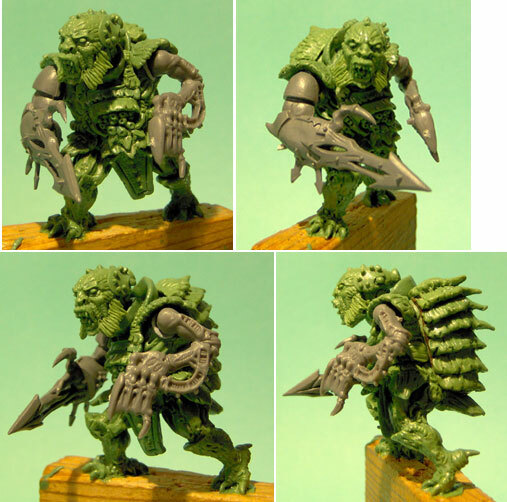 I had some spare GW weapon arms and shoulder armour, and couldn't resist trying them out on 3 of the new Psychic Mutant Scrunts. 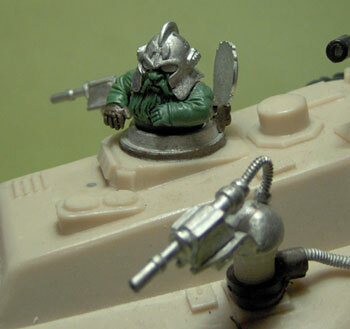 I'm really pleased with the way they look and to show them off better I painted the metal body grey. 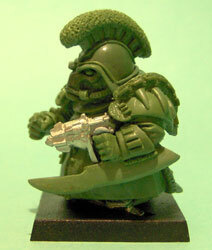 The 3 scrunts I choose from the new set had separate Olleys Armies arms anyway so replacing them with GW ones was easy. 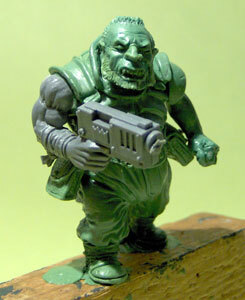 Here are some pictures of the scenery I am making to set my new Psychic Mutant Scrunt Troopers in when they are painted. 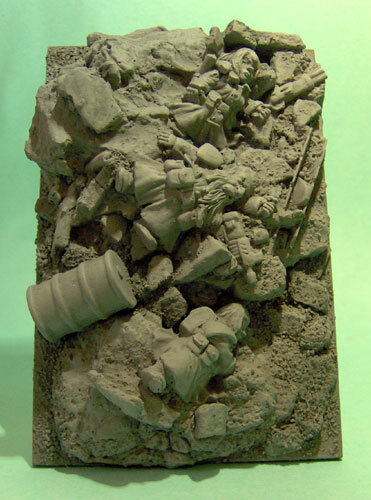 There's some pictures of the scenery before its painted and some scenery I have partly painted. 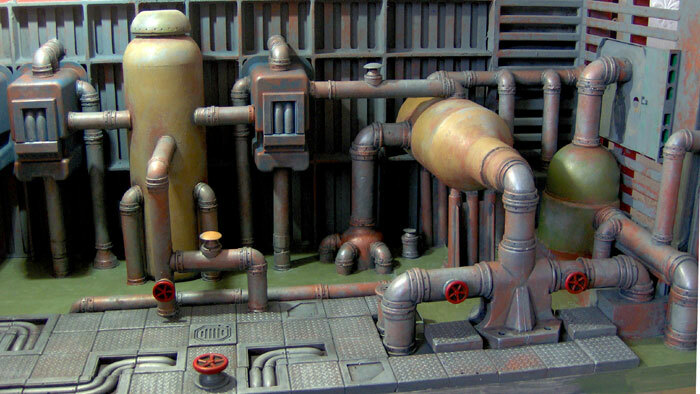 I've used plaster cast scenery pieces (flooring and industrial pipes) I bought from Ebay and various bits of plastic containers and junk that I've saved up to construct the scenes. 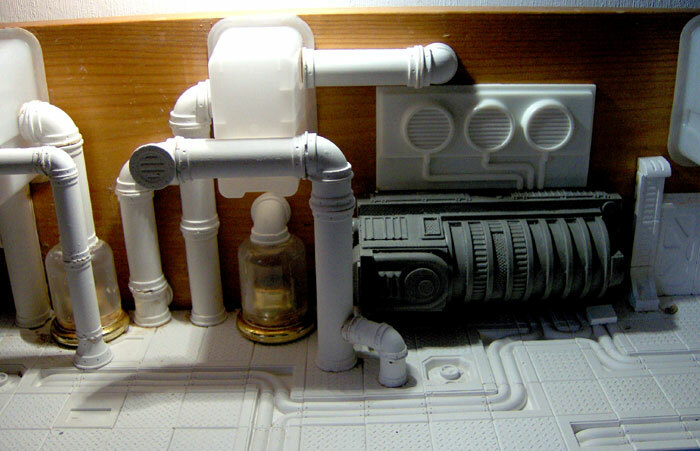 I found old ink cartridge holders very useful. 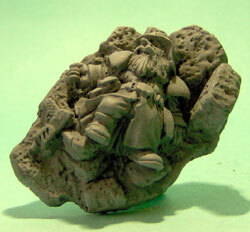 These are not going to be reproduced commercially they are purely for display of our ranges. 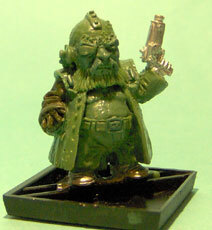 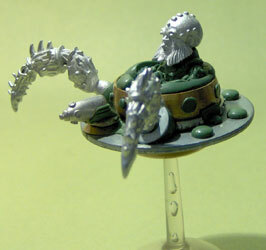 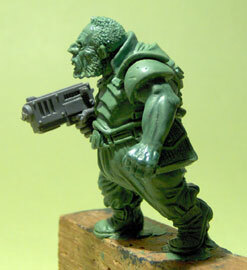 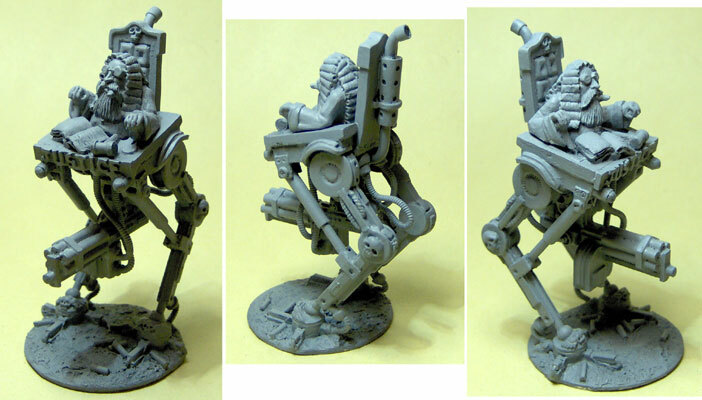 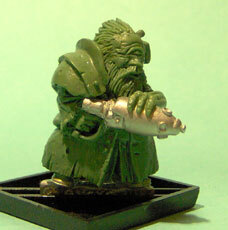 The new scrunt legwalker is based on the original Judge Legwalker sculpt we bought from Aaron Brown. 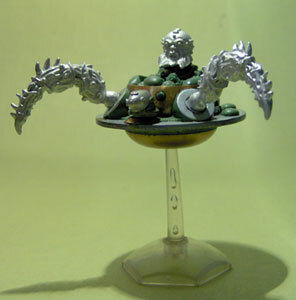 Bob made a new top and adapted two scrunt minis to fit. 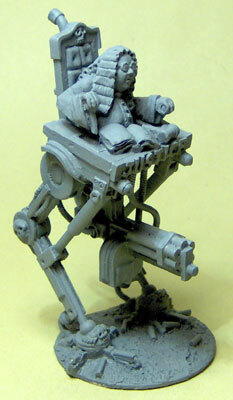 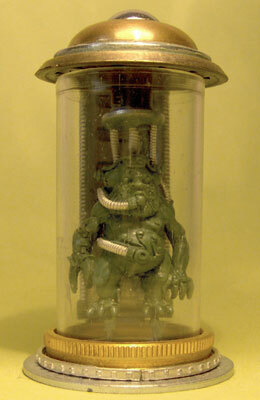 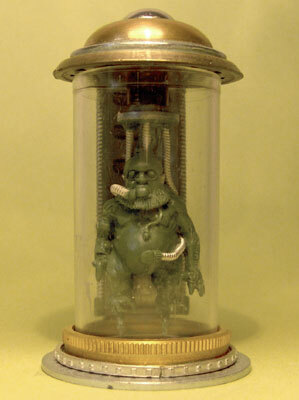 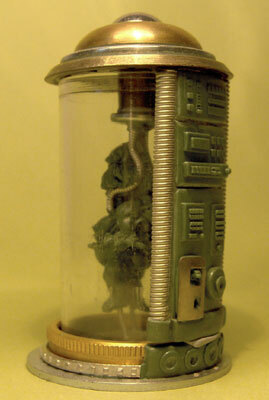 We both love the original Judge Legwalker, so Bob also made an alternative cigar smoking scrunt judge to fit it. 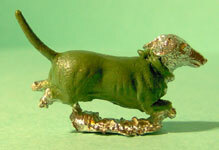 Bob made some basic scrunt body dollies, had them cast and from them made 20 new scrunts. 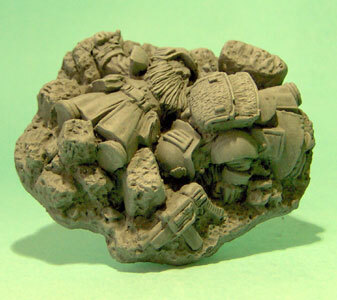 They are smaller than our usual Scrunts, measuring 15mm from foot to eye level. 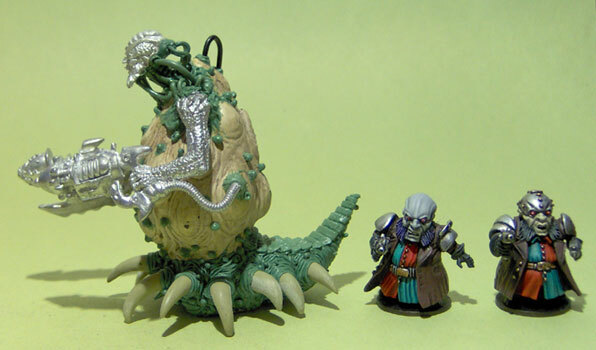 In these cash strapped times we wanted to make a smaller lighter scrunt so it could be sold cheaper, and more through luck than any plan, they go really well as Juves with our exsisting scrunts and also as you can see from the scale comparisons work well with the slighter scaled 25 & 28mm minis produced by other companies, shown below are minis from Golgo island minis, GW, Hasslefree, and Wargods minis, (no copyright infringement intended). 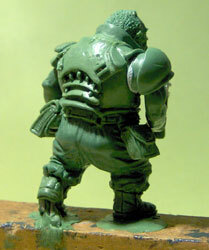 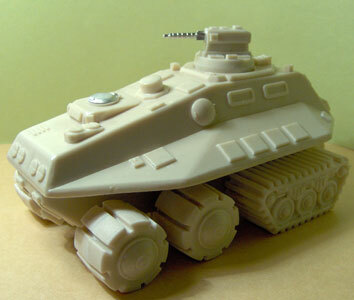 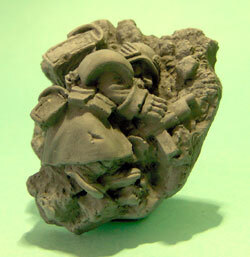 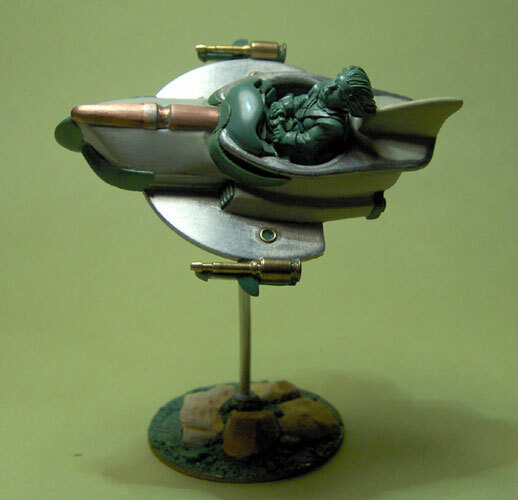 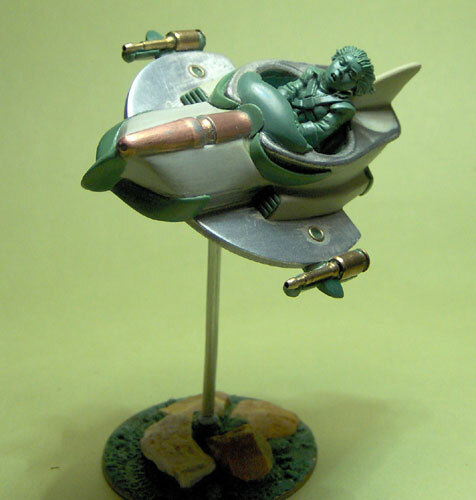 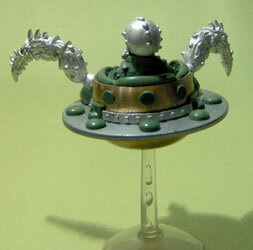 I've done some more work on this model and hope to have it finished soon so it can go on the next mould.